Home · Property Management · Remodel and Repair : Making Your Own Repairs vs. Hiring a Contractor: What’s the Right Choice? Making Your Own Repairs vs. Hiring a Contractor: What’s the Right Choice? When you’re a landlord and responsible for an apartment building, repairs are going to be something you have to deal with. It’s a natural part of the job. Things break, become damaged, or simply wear out due to use and time. Whether you should make your own repairs or hire a contractor to do them for you comes down to two things: how handy you are and the size and scope of the repair. Of course, how much money you have to spend is also a concern, but you want the repair done right, regardless of cost. If you skimp on a repair to save money, that could get you into trouble later. You may end up having to pay someone else to “re-fix” the issue, and that could mean more expense than you would have had if you’d just paid a contractor in the beginning. Take cost into consideration, but don’t let it be the only deciding factor when you’re trying to determine what to fix yourself and what to hire out for. Big jobs like replacing a roof need a contractor, of course, but what about a new window, or some tile in the entryway? How do you feel about painting or replacing a bathroom sink? The more you know how to do on your own, and do correctly, the more money you can save. But there’s another trade-off: your time. 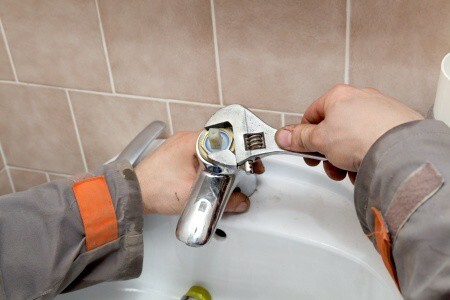 Depending on how involved you are in the business of being a landlord, and what other obligations you have in your life, you may find that the time required to make repairs yourself is hard to find, and would be better spent doing something else. In that case, hiring a contractor makes a lot of sense. They can do the job quickly and efficiently, and you won’t be required to take time out of your schedule to handle the repair. However you choose to do things, make sure your tenants know what kinds of repairs constitute an emergency and what can wait until business hours. Also make sure they know exactly who to contact if there’s a problem. A lot of landlords who have apartment buildings also have a property manager, but that’s not the case with every landlord. Some of them prefer a more hands-on type of experience that comes along with their investment in a rental property, so they may also be more likely to do at least some repairs yourself. As long as you treat tenants properly and follow the laws, there’s really no right or wrong way to be a landlord. Whether you choose to make your own repairs or let someone else handle them doesn’t speak to your ability to be a successful landlord. Knowing your own limitations when it comes to money, time, and handyman ability are all very important. Be honest with yourself about the work you can do, and the work you want to do. Then hire a contractor to do the repairs you aren’t comfortable with or don’t have time for. You’ll be happier, and so will your tenants.